The songs of the Sephardic Jews of Medieval Spain are some of the most beautiful melodies to have been written. They have been passed by mothers and daughters of the Diaspora through generations of tradition, and speak to us of spirituality, culture, love and life. Mother Tongue recreates these powerful melodies from Sephardic, Christian and Moorish communities of Old Spain in an evocative contemporary setting which embraces elements of early music, world music and jazz. Vocalist Carolina Moon, hailed as 'utterly beguiling' by the Sydney Morning Herald, sings in a range of languages and styles to create a unique multi-cultural experience. 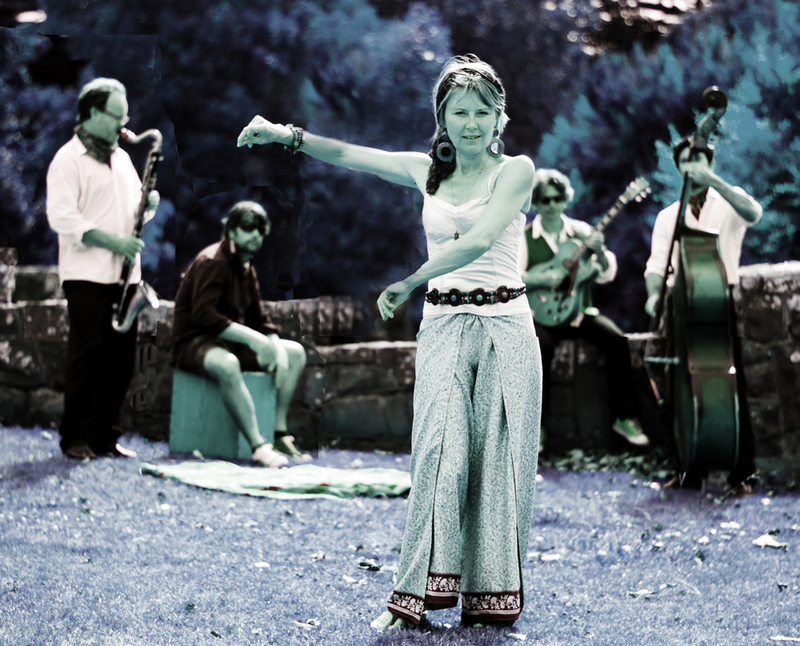 Ms Moon is a multi lingual, improvising vocalist with a passion for medieval and traditional world musics. Having misspent her formative years on the London jazz and world music scene, she moved to Sydney in 1995. Here she performed and collaborated with many leading artists including Mark Isaacs with whom she first performed the Sephardic repertoire. In 2002, she travelled to the Jazz India Vocal Institute, Mumbai, studying voice and raga. Now based in Auckland New Zealand, Carolina completed her Masters of Music in Performance in 2009. Her performance experience spans the UK, Australia, India, China, Aotearoa and the Greater Pacific. Nigel has contributed scene-stealing solos to an astonishing variety of musical groups and settings, bringing with him the dedication to the guitar that earned his place in Robert Fripp’s legendary League of Crafty Guitarists. His solo albums are ‘Music for Flem 2’, ‘Thrum’, and ‘Visitation’ (2007). Gavin is a guitarist with remarkable versatility, respected by other players around the world. He continues to work both in New Zealand, Europe, Australia and the United States. Projects include The Jews Brothers, Nairobi Trio, Bravura, Richard Adams, Whirimako Black, Lorina Harding, Carolina Moon, support to KD Lang, 3 penny Opera, Pacific Curls. Roger Manins is one of New Zealand’s leading international saxophonists. Based in Sydney and New York for much of his musical career, he came to prominence performing with the vanguard of Australian jazz. He won the Award for saxophone at the Wangaratta International Festival of Jazz in 2002 and returned to New Zealand in 2004. Manins is actively in demand locally and internationally. He was recently awarded the honour of ‘Jazz Hero’ for NZ in the inaugural US-led International Jazz Journalists Jazz Awards 2012. He is recorded on over 25 jazz albums with many of the leading lights of Australasian jazz and has four solo album to his name. Jess, after completing her performance degree at Auckland University, travelled to Ireland as part of a traditional Irish stage show in Galway. She toured with the international world music show “Barrage” based in AlbertA, Canada. After almost 5 years of extensive touring encompassing 5 continents, and features on many national TV stations, she returned home to continue her career as a full time freelance musician concentrating on writing, arranging, touring and recording for various jazz, country, and celtic artists. Kevin is one of New Zealand’s finest contemporary jazz pianists. His distinctive approach to jazz harmony is probably the most recognizable element to his playing and compositions and he has collaborated with artists from many different genres and backgrounds, as evidenced in his latest Warner release Field of Vision. In addition to his own projects, Kevin performs with Whirimako Black, Nathan Haines, Peter Urlich, the APO. Born in Germany’s Black Forest area, Matthias brings a unique perspective to the Carolina Moon Ensemble. His classical precision, artistry and exceptional bowing techniques – he is a full time member of the APO – combined with a jazz knowledge are an essential characteristic of the group’s sound. Ron Samsom’s musical career has seen him work with international jazz artists such as Nathan Haines, Jim Brenan and Florian Ross, Stephon Harris, Karin Allyson, Randy Brecker, Marlena Shaw, Slide Hampton and Bob Wilber in countless recordings, concerts and workshops. Ron’s drumming skill and unique accompaniment style are a sought after commodity that can be heard on many highly regarded jazz recordings and has seen him featured in many of the major jazz festivals throughout Canada and New Zealand. New Zealand artists he has worked with include Whirimako Black, Roger Manins, Dixon Nacey, NZSO, Carolina Moon, Karen Hunter to name a few.